The Café at the Taj Boston is an elegant, romantic restaurant where French Executive Chef Franck Steigerwald has created an exciting menu of French cuisine, New England favorites, and Indian specialties. Sitting at a table for two overlooking fabled Newbury Street referred to as the "Rodeo Drive" of Boston, I had the opportunity to appreciate the lovely details of the dining room where the striped gold walls have many stories to tell with framed black and white photographs of the many celebrities who dined at the restaurant over the past 79 years including Shirley Temple (1929), Rose Kennedy (1939), baseball great Ted Williams, and Count Basie (1942), the Duke and Duchess of Windsor (1945), and Elizabeth Taylor and Montgomery Cliff (1951). Edward F. Nesta and I had dinner at The Café in October 2008, where cobalt and crystal chandeliers, gold sconces dressed with black lampshades, and recessed lighting in the tray ceiling provided a warm and romantic ambience with the tables dressed with pristine linens and accessorized with peach roses in narrow cylinder vases, low bowls with tea lights, and sparkling crystal wine glasses and cobalt stemmed water glasses. Since the restaurant features French, New England, and Indian specialties, we wanted to fully appreciate the different nuances of the menu. 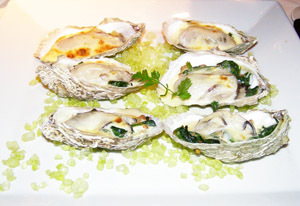 Edward began with a lovely French first course of Oysters Gratinées consisting of six warm oysters with spinach and bacon, and white wine Sabayon beautifully presented on a bed of green salt on a square white plate. The oysters were excellent and the only thing that would have made them more perfect was if he had found a pearl in one of them. I selected a New England favorite, the Lump Crab Cake, which was a large warm breaded crab cake served with mixed greens and homemade remoulade sauce. 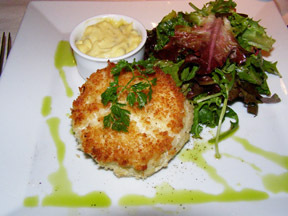 Made with fresh crab from Maine, the cake was gorgeous with a crispy golden exterior and succulent and sweet interior. 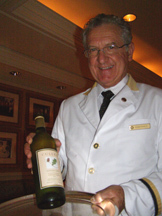 Our waiter, Gianfranco expertly paired our courses with a Cullen Vineyard, Margaret River, Ephraim Clarke 2007, made with a blend of 80% Margaret River, and 20% Sauvignon, Australia, 13% alcohol. After experiencing the French and New England components of the menu, we wanted to explore a few of the Indian specialties. For his second course, Edward had Lamb Roganjosh, a specialty of Kashmir, which was lamb cooked in aromatic spices. 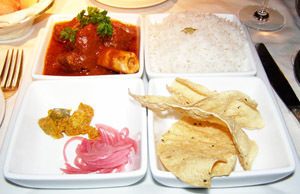 This course was presented on four square white plates, and consisted of lamb in a rich sauce, basmati rice cooked with cardamom, mango pickle, and homemade red onion pickles. The lamb was tender and flavorful in a rich and spicy sauce that when combined with the basmati rice was excellent, and with the mango pickle and accompanying red onion pickle acting as palate cleansers. 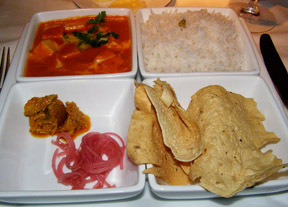 I had the Paneer Makhni, which was cubed Indian cottage cheese served in a tomato and yogurt based sauce and accompanied with basmati rice cooked with cardamom, mango pickle, homemade red onion pickles, and pappadams, which are thin crisp flatbreads made with lentil flour and flavored with peppercorns. This was another well-presented course that was exotic and visually appealing, with a perfect blend of spice to intrigue the palate, yet not so hot as to intimidate. 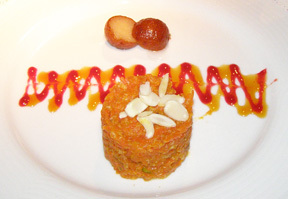 For dessert, we continued with another Indian specialty, Carrot Halwa and Gulab Jamun, which were unusual taste treats. When Chef Pradeen Prathapan brought the desserts to our table he explained that 90% of Indian desserts are made with only milk, and 10% include flour, usually gram (a chickpea flour), and sugar. He described Carrot Halwa as a dessert from the northern part of Indian made with shredded carrots, milk, cardamom, sugar, and nuts. The Carrot Halwa was presented as a lovely cylinder of flavor on a square white plate with the Gulab Jamun cut in half, which was also very interesting. This northern Indian sweet was made from milk concentrate, rolled into balls, fried, coated in sugar syrup, and was paired with an ice wine. The Gulab Jamun reminded me of a sweet round dumpling that we ate with accompanying caramel and raspberry sauces that were drizzled on the plate. After having our palates on a veritable and delectable journey around the world, Gianfranco brought us a selection of almond paste cookies and espresso to finish our evening. 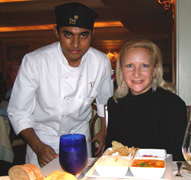 Read about the Taj Boston and The Café in the Hotels and Resorts and Chefs' Recipes sections. Read other articles on Boston in the Destinations, Hotels and Resorts, Restaurants, and Chefs Recipes sections. For information on Boston, please visit the Greater Boston Convention & Visitors Bureau website: www.BostonUSA.com. © November 2008. Luxury Experience. www.LuxuryExperience.com All rights reserved.